Description: I.N. 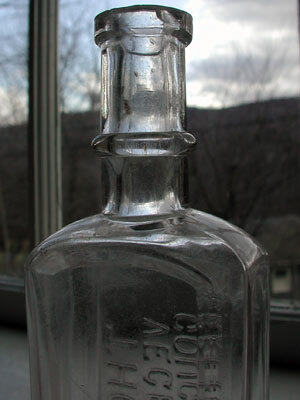 Thorn was an established druggist in Brattleboro, Vt., in the mid-1850s and compounded his extract of hops in the early 1870’s. His son, I.B. Thorn, joined him in business a few years later. 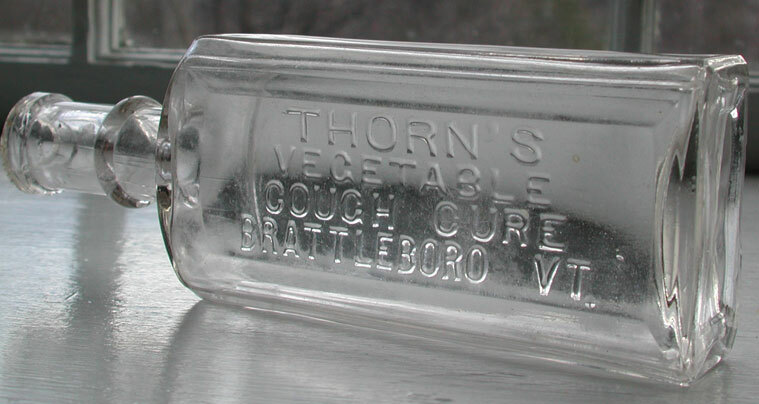 By the 1890’s the firm was styled as Thorn’s Medicine Co. and was also selling a Vegetable Cough Cure (Courtesy of Bill & Betty Wilson). Other products included the "Hop and Burdock Plaster” the "Hop and Burdock Pill" and "Thorn's Sarsaparilla.” This Vermont Cough Cure with ring neck is extremely scarce and would make a great addition for any Cure Collector’s collection. Condition: Very good, strong embossing. Very small chip on back side of lip.